Noh, a theater form that originated in the fourteenth century, was associated historically with the ruling warrior class, who made up about 5% of Japan’s pre-modern population in the late feudal period between 1600 and 1868. 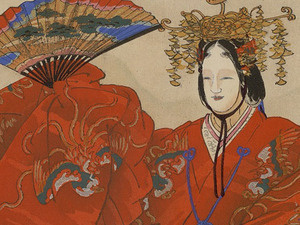 Kōgyo’s paintings and prints are more than reproductions of what he saw and sketched in the noh theater. He tried to capture what he saw as the essence of a play, which led him to make additions, subtractions, and various other changes to the actual performance in his prints. He even went so far as to put his ideas of the real-life facial expressions of the characters he depicted on the masks the actors in his prints wore. And he added to his prints scenes and texts from the stories of the play that were not portrayed in the play on stage. In one print he showed the play’s primary character performing under water, even though he obviously did not do so on stage. Kōgyo was not a camera; he was an artist. Wednesday, April 24 at 12:00 a.m.